This Transformational Weekend Event was inspired by one of my most popular blog posts to date. It started with an observation about my son. Dare to Be DINO is a statement to remind you to be bold, to be brave, and to be strong. It is a reminder empowering you to grab courage to get off the sidelines of life and stop waiting for things to happen. It is a reminder that you deserve to be happy. To be joyful – no matter what the circumstances you live in and no matter what other people say or think. 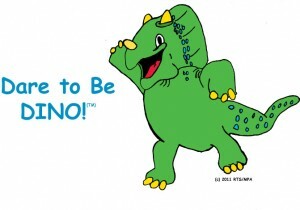 DINO is an inspiration to start doing that. Find the thing you have always really loved-but never do anything about it to make you happy. Just start. And then always stick to it. It doesn’t matter what people think. It matters that you are able to be happy and experience joy. As adults, we do forget how important it is to slow down and take time for fun. People who feel the most sense of completeness and purpose have found a way to take what they do that makes them joyful- and then they create their life and work around it. In many cases, they take what makes them joyful and it becomes part of how they make money. There are thoughts that stop most people from acting on this wisdom. If that is you who says these things- or statements like them- and you are ready to take a step to ‘go for it’- to create a plan for success, then you need to attend the Dare to Be DINO Transformational Weekend Event. The Workshops are Designed to experientially transition participants from being stuck without a vision of purpose, to identify, ignite, and infuse energy into a joy filled reason to go for big dreams. Attendees discover courage to take action and confidently develop a plan that allows goals to be achieved. Adults who are feeling stuck in life. People who want to change course and are unclear where to go and how to navigate change with a plan to achieve success with support along the way. We are working out the location details for this event. To be put on the roster for follow up and registration information, please submit your contact information here. The tentative weekend event date is in Oct of 2016.